Since I have always had a positive outlook on life, I took the news in stride and accepted the day-to-day living with the situation. As most ostomates, I experimented with several products from various manufacturers. My only problem was the “heat” the pouch caused against my body. A Koolostomy Pouch Cover is a product that will assist the ostomate with eliminating moisture and heat associated with wearing an ostomy appliance. The Koolostomy Pouch Cover slips over the existing collection bag (pouch). This product will “wick” moisture away from your skin, making the appliance comfortable to wear. 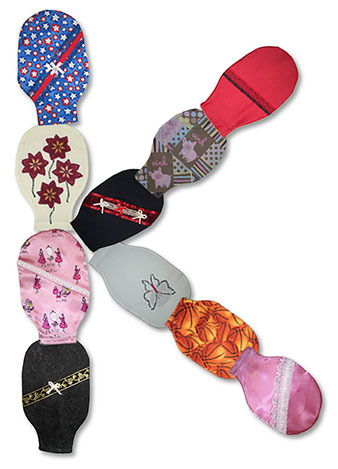 Koolostomy Pouch Covers can be worn with most pouches, regardless of the manufacturer. I am an ostomate with a permanent colostomy. It was discovered in the early part of 2001 that I had a large mass in the pre-sacral space (lower part of the pelvic area). Prior to surgery my doctor informed me about colostomies. It wasn’t until after surgery that I learned I would have to deal with wearing an ostomy appliance for the rest of my life. Since I am an experienced seamstress, I searched to find a comfortable material to cover the pouch. I purchased several different types of materials and finally came upon a lightweight fabric that suited my need. Then the idea of a decorative pouch cover came to mind. Because we must wear this appliance, why not make it look and feel good. The Koolostomy Pouch Cover does both! I solved the “heat” problem, but also I now wear covers that make me feel good about myself. All Koolostomy Pouch Covers are machine washable. The Koolostomy Pouch Covers are available in several different designs: Basic, Silky Satin, Swimwear, The Fly, The Storage, The Lacy, Shower Pouch, Victoria, The Dolphin and Custom Design. They come in children and adult sizes. For special orders not listed in the catalog, please contact us through our Customer Service.